Most people are chasing big dividend payers right now in this “3% world” we live in. Meanwhile, a small group of “hidden yield” stocks are quietly handing smart investors growing income streams PLUS annual returns of 12%, 17.3%, or more. Let’s talk about how to find these stocks, and bank 12% returns or better every single year, by following a simple two-step formula. You have to do more work to figure out if those yields are actually supported by the company’s cash flows, earnings power, long-term business prospects, etc. You have to sift through the same company’s history to determine how long it’s been paying those dividends. How consistently it’s been paying those dividends. And especially if it’s been regularly increasing its dividend payments. The best time to buy a dividend grower is anytime. But we can tip the odds in our favor even further when we buy at moments like these – when the share price is due to “catch up” to the dividend. The “efficient market” is always slow to adjust to higher dividend levels. Folks who scan the papers are looking at trailing yields. They’re not considering next month’s payout increase, which is likely not yet priced into the stock quote. Which means we should start our search for 12% by considering companies set to hike in the next month or two. Here are nine firm’s poised to give their investors a payout raise in June. 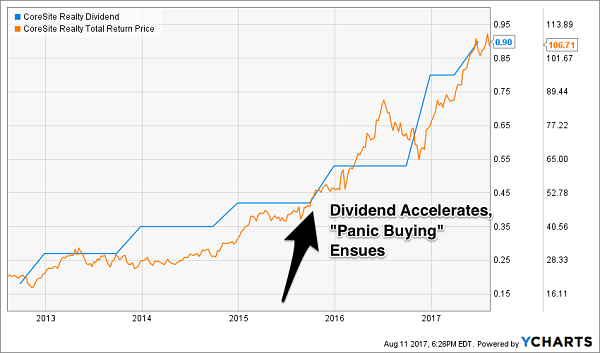 Every dividend that eventually “accelerates” begins with a simple payout hike. We’ll talk about purchase timing in a moment. First, let’s review the nine stocks most likely to raise their dividends next month. 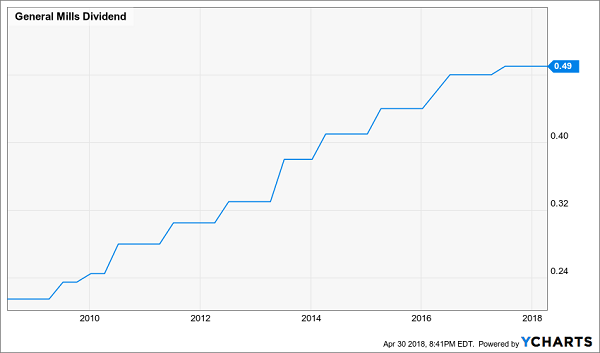 The Dividend Aristocrats are a group of stocks that have increased their annual payouts for at least 25 consecutive years. But surely, there must be some title we can assign to American Tower (AMT) amid its similarly spectacular streak. After all, this REIT has delivered 25 consecutive quarterly dividend hikes. And it should announce No. 26 sometime in very early June, or possibly even late May. American Tower, as a reminder, is a real estate investment trust (REIT) that leases out telecommunications towers and other infrastructure to the likes of AT&T (T) and Verizon (VZ), making it a vital link in the chain of what essentially is a utility service. That stability (and rising lease prices) helps AMT fund ever-growing dividends; its payout has shot up by 134% since the start of 2014. Health mega-insurer UnitedHealth Group (UNH) is one of the best examples of how current yield doesn’t always exactly tell you the full story of a stock’s income potential. For instance, how do you jack your yield up by 170% and still end up with a 1% yield? Oh yes. Have your stock quadruple over the same time period. UnitedHealth Group (UNH) Gets an “A” for Effort! I’m willing to give UnitedHealth the benefit of the doubt. The company brilliantly navigated the decaying of the Affordable Care Act, and came out as one of the best-positioned health insurers in the game. It cracked the $200 billion mark in annual revenues in 2017, and in April, the company beat Q1 earnings estimates and raised its full-year profit guidance. In other words, UNH still is running full steam ahead, and investors should expect a healthy increase to the payout sometime during the first week of June. Kroger (KR), the largest pure-play grocery stock in the game, has had a whirlwind year or so as the market tries to decide whether Amazon (AMZN) and Whole Foods are going to fricassee it, or if it can roll with the punches. The company has spent the past month or so recovering from a March earnings report in which Kroger issued a disappointing earnings forecast for 2018. That’s because it’s not just Amazon on the prowl, but Walmart (WMT) too, with the big-box retailer making new inroads in things like meal kits and online orders. Kroger’s dividend growth already took a big step back in 2017, when a roughly 4% hike fell well short of the prior year’s 14% improvement. It’s hard to imagine anything impressive coming during the next expected dividend step-up, which should be late in the month. Investors actually should be on watch for a dividend increase from Alexandria Real Estate Equities (ARE) just about every quarter. That’s not because ARE is an every-quarter hiker like American Tower, but because you can’t exactly set your watch by its increases. Alexandria Real Estate has increased its dividend at least once every year since 2014, and that increase has been announced early to mid-June in 2014, 2015 and 2017. 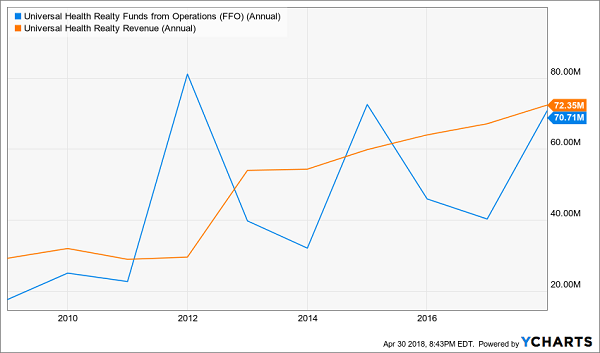 Yes, the company just raised its payout by 8% in April, but historically, the company most often raises its payout in June, so be on the lookout. As a reminder, Alexandria Real Estate is an extremely focused REIT that is dedicated to life sciences real estate in just a handful of major regions, including Seattle, San Francisco and the Greater Boston area. It’s also coming off a strong first quarter in which it grew funds from operations by about 10% year-over-year. The good news for Target (TGT) is that it’s enjoying an up year of about 7% when the rest of the market is sitting on average losses of about 2%. Better still is that there’s some fundamental backing to its success. The retailer’s holiday season was mostly successful, with same-store sales and revenues both coming in better than expected when Target reported its results in March. Still, Target faces short-term headwinds such as pay increases eating into its profits; the company actually missed Wall Street’s quarterly earnings targets in that same report. It’ll also be sinking costs into remodeling hundreds of its stores to try to stay ahead of other brick-and-mortar retailers, and to maintain some sort of appeal as more consumers migrate to shopping online. The good news is, Target also is gaining ground on that front, notching a fourth consecutive year of 25%-plus growth in digital sales. 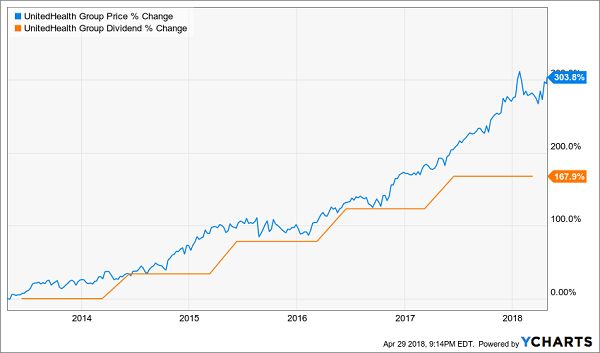 Looking ahead, expect Target to renew its membership in the Dividend Aristocrats with its 47th consecutive annual dividend increase. The announcement should come sometime around mid-June. Universal Health Realty Income Trust (UHT) is good for a pair of dividend hikes every year. The question is whether that will continue this upcoming quarter amid what has been a pretty dismal year. While REITs have had a rough 2018 – the Vanguard REIT ETF (VNQ) is off about 8% so far – UHT has been kicked around to the tune of about 20% year-to-date. UHT – a healthcare REIT that mostly specializes in medical office buildings and acute-care hospitals, but also delves into properties such as freestanding emergency departments and childcare centers – is not far removed from a decent first-quarter earnings report. 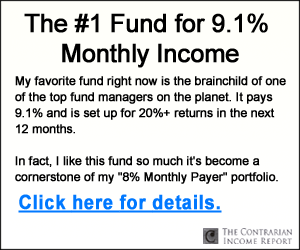 The company announced a 5% year-over-year increase in FFO, to 84 cents per share, which is more than enough to cover its current 66.5-cent dole. Universal Health Realty Income Trust’s next announcement should come sometime early in the month. Duke Energy (DUK) is one of the companies that give utility stocks their good name. 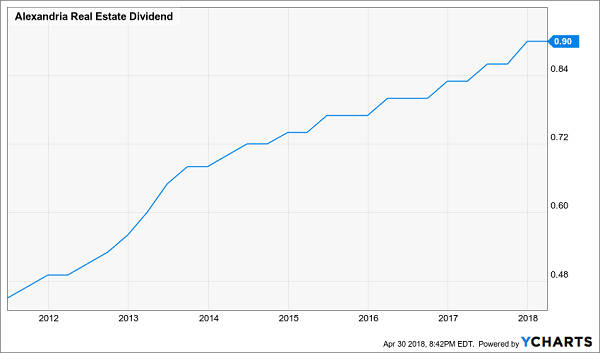 This utility player has delivered uninterrupted dividends for more than 90 years, and has been raising its payout since 2005. There’s little reason to expect any differently in 2018. The company earned $4.57 per share in 2017, which translates into a payout ratio of 78% on its current 89-cent quarterly payout (annualized). Moreover, Duke’s profit guidance for 2018 of $4.55 to $4.85 per share implies another 3% earnings growth at the midpoint, implying a little more headroom for dividend growth. Duke Energy should announce its next dividend, usually payable in mid-September, sometime in the first two weeks of June. But be warned: This utility’s dividend growth has slowed to a crawl, with 2017’s installment a mere 4% hike over its year-earlier payout. General Mills (GIS) might be a consumer staples company, but it’s acting like a biotech bust in 2018, down 26% amid what has been a colossally difficult 2018. General Mills recently suffered its worst single-day loss in nearly a decade, dropping just shy of 9% after it warned investors that its full-year profits would come in between $3.08 and $3.11 per share – well below expectations. That’s because rising ingredient prices and ‘an unprecedented rise in logistics costs’ are gobbling up profits, according to CEO Jeff Harmening. As a result, GIS is pulling a page out of the old ‘struggling-with-growth’ playbook, announcing it would cut wherever it could to improve its margins and gussy up the bottom line to please investors. The only upside, if you’re dying to find one, of the stock’s precipitous decline is that the yield has been propped up to above 4%. But I’m not confident in management’s ability to fatten that number up much more in late June, when the company traditionally announces its annual dividend increase. General Mills’ last payout improvement was less than 3%. Enterprise Products Partners LP (EPD) is one of North America’s largest midstream oil-and-gas companies, boasting roughly 50,000 miles of pipelines transporting natural gas, nat-gas liquids, crude oil and other energy products. On top of that, it also boasts storage for NGL, refined products, crude oil and nat gas, not to mention some gas processing plants and even ship terminals. More impressive is the fact that this master limited partnership (MLP) has been increasing its distribution on a quarterly basis for years, including through the 2014-2016 energy downturn that caused many other MLPs to stop growing and even cut into their payouts. It has been able to maintain this streak because of its conservative but responsible mid-single-digit annual distribution growth. EPD is in excellent position to keep writing bigger quarterly checks, too, considering it reported a 23% jump in Q1 distributable cash flow to a record $1.4 billion. That’s good for a safe 150% coverage ratio on its distribution. We should focus on the raises that do turn into accelerating dividends, which present a big “problem” to Wall Street analysts. These guys and gals project everything linearly, and their spreadsheets literally break when payouts soar at a faster and faster rate. As you can see, there have been several opportunities to buy this stock for 20%, 30% and even 40% annual returns. And we’ve timed two of them on the dot using the techniques I shared with you today. Right now, at this very moment, there are seven in particular that I think you should consider buying. 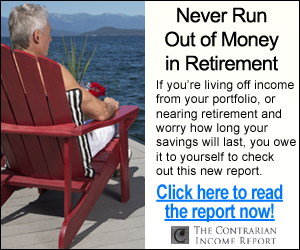 These dividends are growing fast and beginning to accelerate. Soon, you’ll be reading about them in mainstream financial rags – so I’d buy them right now, while they are still under the radar (and cheap with respect to their upcoming payout growth). These 7 firms stand to do well no matter what the broad market does … regardless of what happens in Washington … and irrespective of interest rate trends.